On a visit to South Africa about nine years ago Doug Daft, then the chief executive of The Coca-Cola Company, remarked when asked to comment on the company’s growth ambitions, that he would only be happy when the C on household taps was taken to stand for Coca-Cola. Given the shortage of running water in households in so many of South Africa’s townships, that might not be a sufficiently ambitious target for John Ustas, the chief executive of Amalgamated Beverage Industries (ABI), a wholly owned subsidiary of SA Breweries. Ustas says the “embedded” annual growth rate for Coca-Cola in this country is 2 percent but he believes there is opportunity for this to be pushed to 6 percent. And Ustas believes that opportunity lies in the townships. “In South Africa, the consumption of Coca-Cola is skewed to the upper income because there’s limited availability in the townships,” says Ustas. Nowhere else in the world was Coca-Cola consumption skewed to income, he notes. The skewed distribution in South Africa is attributed to the lack of even the most basic form of retail infrastructure in the townships. “We are servicing just under 70 000 (retailer) customers; we believe there’s potential for 200 000,” says Ustas. The bulk of the added customers would be informal traders and other outlets in the townships. Ustas says he “sees a lot of similarities between South Africa and Mexico” and for this reason believes consumption in the local market can increase to the sort of levels achieved in Mexico. Coca-Cola consumption locally is equivalent to 282 servings of 8 ounces, or 66.7 litres, per person each year compared with 665 8 ounce servings, or 157.3 litres, in Mexico. Achieving the 6 percent growth rate that Ustas believes is possible will require a hefty amount of investment by ABI. More company reps will be sent out to beef up ABI’s “feet on the street” capabilities, there will be more – albeit smaller – trucks and more signage, and the “cold drink cooler” density will be increased from 40 to 80 coolers per 10 000 population. Ustas does not underestimate the challenges. While he describes Africa as the “best Coca-Cola market” he has ever seen, he acknowledges the difficulties of creating a distribution system for the all-important township market. He reckons that putting the systems in place to realise the 6 percent growth potential could take up to three years. Achieving this growth rate will reverse the squeeze on margins that ABI has suffered since 2004 as pricing has failed to keep up with inflation. ABI accounts for about 60 percent of the Coca-Cola sold in South Africa, with the rest shared by three bottlers. Mozambique aims to attract $4 billion in foreign direct investment this year, double last year's figure, the head of the government's Investment Promotion Centre (CPI) said on Thursday. CPI General Director Lourenco Sambo told Reuters in an interview that his agency would market the country's agriculture, mining, energy and infrastructure sectors to foreign investors from India, China and Europe. “Our major target is to have more than $4 billion of foreign direct investments in 2011, up from $2 billion last year when the global financial crisis swept across the world resulting in the downward trend of investments”, Sambo said. Sambo said a government delegation led by Prime Minister Aires Aly is expected to visit India next month to seek investors. “We will not deliver a political speech there but to tell the Indian firms to come and invest in our mining and agriculture sector where we have potential and also improve our trade corridors such as ports and railways”, he said. Sambo said priority will be given to agriculture, where the government hopes to improve productivity to cut its dependency on imports and help the country bring down food prices. “We will invite Indians and the Chinese investors to put more money in agriculture and the transport infrastructures”, he said. Johannesburg - Multinational brewer SABMiller sees volume growth of eight percent a year in Africa, its regional head said on Tuesday, as demand is expected to continue growing on the continent. Mark Bowman, managing director of SAB Miller Africa, also told reporters on a teleconference call that the brewer was unlikely to make any big-ticket acquisitions on the continent in the near future. The London-based brewer expects “organic volumes” for beer and other beverages to grow at about 8 percent a year in Africa, he said, referring to growth excluding the impact of acquisitions or divestments. “We're optimistic of growth in the medium, short and long term. There are likely to be bumps along the road, because Africa is a different place to do business,” Bowman said from Miami, where he is attending an industry conference. With increased investor interest in Africa, the continent has become “the flavour of the month” Bowman said, making it more difficult to make acquisitions. Home to about one billion people, Africa boasts dozens of fast-growing economies and an emerging middle class and is increasingly seen as the next big destination for global investment. Johannesburg - South Africa has taken the first place in an international Open Budget Survey 2010 released recently, beating the United Kingdom, United States, Germany and all Bric (Brazil, Russia, India and China) countries. Second position went to New Zealand, followed by the UK in third place and France in the fourth position. China ranked the second lowest while Saudi Arabia ranked the lowest. The international Open Budget Survey 2010 is the world's only independent and comparative measure of budget transparency. It uses criteria mainly developed by the International Monetary Fund, Organisation for Economic Cooperation and Development, and the International Organisation of Supreme Audit Institutions. The survey covers 94 countries and is undertaken every two years. The Open Budget Index (OBI) score for countries surveyed in 2010 was 42 out of 100. South Africa received a score of 92. Stanlib economist Kevin Lings said only 20 of the 94 countries had OBI scores above 60 and could be characterised as providing their citizens with enough budget data to enable them to develop a comprehensive understanding of their national budgets. Only 17 of the countries examined provided comprehensive budget information on policies intended to alleviate poverty. Another 41 countries provided no information on extra-budgetary funds in their budget proposals. Lings said South Africa's budget process had improved dramatically over the years, especially after Trevor Manuel became the Finance Minister. "The documentation has become consistent, transparent, and rich in detail; something that was completely lacking prior to 1994," he said. "Unfortunately, a transparent budgeting process is a necessary but not sufficient condition for effective government." He suggested that although the National Treasury allocated the funds and set key expenditure priorities, most departments were failing to deliver acceptable outcomes using the available funds. Current Finance Minister Pravin Gordhan was expected to deliver the 2011/2012 national budget in Parliament, Cape Town on Wednesday. Melbourne-based investment and advisory firm the Wingate Group and Safika Holdings, one of South Africa's largest investment holding companies, have formed a joint venture called Winsaf. The joint venture, which will be Melbourne-based, aims to undertake principal investments in Australia and Asia, and help Australian companies invest in Africa. To further strengthen the relationship, Safika has also taken a strategic holding in Wingate. Safika has substantial investments in a number of well known South African corporations including Standard Bank, Liberty Life and Ntsimbintle Mining (a partnership with BHP & Anglo American). In 2004 Standard Bank, Africa’s largest banking institution, became a substantial shareholder in Safika. Safika’s Chairman, Saki Macozoma is Deputy Chairman of Standard Bank. Meanwhile, Safika director and head of investment Marc Ber has been appointed Winsaf chief executive and will continue to perform all his responsibilities by dividing his time between Johannesburg and Melbourne. Wingate head of private equity Steve Lipchin and the group's capital solutions managing director, Richard Blumberg, will work with Ber to develop the Winsaf business. The two businesses will operate in close conjunction, jointly investing in opportunities that meet their investment criteria. "The joint venture brings together the knowledge, experience and abilities of two highly regarded, experienced and successful investment businesses that will primarily focus on opportunities in Australia but will also take advantage of growth and developments in Asia," Wingate managing director Farrel Meltzer said. "Winsaf will initially focus on the financial services, transport and logistics, industrial, mining and resources sectors, areas which are poised for strong growth in Australia and the emerging Asian markets. "It will also bring new opportunities for Wingate clients to co-invest in companies that Winsaf identifies as having substantial upside. "In addition, Winsaf will open up opportunities in the African continent, which is experiencing high growth, for Australian investors and, through the very useful connections of Safika, provide assistance to Australian businesses that are seeking to expand into Africa." As part of the arrangement, Safika chief executive Moss Ngoasheng would also join Wingate's board of directors, the group said. Harare - Zimbabwe's tobacco-selling season opened on Wednesday with beneficiaries of President Robert Mugabe's land reform programme forming the majority of those who brought their bundles to be sold at market. Agriculture Minister Joseph Made said the farmers who cultivate small plots were expected to deliver the bulk of the crop, saying it was vindication of the controversial expropriation of thousands of white-owned farms. "This is a clear achievement of our land reform programme," Made said at the opening of the auction sale in the capital Harare. "It is expected that during the marketing season more than half of the tobacco will come from small-scale farmers, that is communal and A1 (small-scale) farmers who now constitute 82% of the total registered farmers," he added. Long, winding lines of pick-up trucks and lorries carrying massive bales formed outside the Tobacco Sales Floor, with some the farmers having arrived at the auctions as early as 3:00 am. Vanessa Kabukuta, a 51-year old grower, expressed satisfaction at this year's price. "The price is better, not bad," she told AFP. "This year I decided to bring my crop earlier because last year the prices dropped to less than $3.00 per kilogramme midway through the season." Kabukuta brought 23 bales to sell at the opening of the sales, up from 14 last year. Another farmer Tendai Muchakagara, 43, sat on top of the bales of tobacco as he waited for the start of the sale. "The price is not that bad, but as you know the early bird catches the fattest worm," he said. "I will bring the rest midway in the season. I will use the proceeds to buy fertiliser and other chemicals." Zimbabwe's farming sector used to be dominated by white-minority landowners before Mugabe embarked on his land reform programme a decade ago. The often-chaotic campaign has seen 4 500 farms expropriated by the state after being seized by people claiming to be veterans of the liberation war. Mugabe has justified the programme as a means to address colonial imbalances but critics say it contributed to the country's economic collapse, with few of the small farmers having either the necessary tools or training. Tobacco production and earnings declined sharply in the years immediately following the start of the programme but it has begun to recover. This year Zimbabwe is expected to sell over 170 million kilogrammes of the golden leaf, up from 123 million kilogrammes last year. Last year, the crop earned the country $384m. Government figures show that China bought 40% of the total tobacco exports from the southern African nation at an average price of $2.88 per kilogramme. Tobacco accounts for more than 50% of agricultural exports, which amounts to about 30% of Zimbabwe's total exports. SA's domestic air passenger numbers are expected to grow at an annual rate of 10.6% over the next three years, the International Air Transport Association (IATA) said on Monday. This will make it one of few countries sustaining double-digit growth and if achieved, will be above the global average. In an industry forecast on Monday, IATA said that worldwide domestic passenger numbers were expected to rise from 1.5 billion in 2009 to more than 2 billion in 2014. The increase of 488 million passengers reflected a compound annual growth rate of 5.7%, compared with the 10.6% that SA is expected to enjoy. Global air travellers are expected to rise to 3.3 billion in 2014, up 32% from 2.5 billion in 2009, fuelled by strong growth in China, IATA said. Global airlines have seen a strong rebound from the sharp downturn in 2009 as economies, particularly in Asia, recover from the recession. But the international air body said the effects of the slump could still be felt in parts of the industry. "The shadow of the global economic recession is expected to remain over parts of the industry for some time to come," IATA director general Giovanni Bisignani said. IATA said China will be the biggest contributor, accounting for 214 million out of the total 800 million new air passengers between 2009 and 2014. In December, IATA revised its profit forecast for the whole airline industry up to $9.1bn this year from a previous estimate of $5.3bn. Last year's profit of the industry was estimated at $15.1bn, compared to September's forecast of $8.9bn. The numbers compared to a total industry loss of $9.9bn in 2009. "China will record the highest compound annual growth rate of 13.9% and contribute an additional 181 million passengers. Other countries with double-digit growth include Vietnam (10.9%), India (10.5%) and the Philippines (10.2%)," IATA said. Ivanhoe Mines has made major “Tier 1” copper discoveries in the Democratic Republic of Congo and South Africa, chief executive Robert Friedland said on Wednesday. The Congo discovery was the first such copper find in the central African country since 1906, Friedland told a mining conference in Cape Town. “Tier 1” indicates a very large deposit of high-grade copper ore.
Friedland said further details of both discoveries would be announced soon. FILING expenses is one of Baobab’s least favourite things to do, never more so than after a trip to Angola. It is painful to explain to The Economist bosses that Luanda, the capital, really is that expensive. A by no means luxurious hotel room costs $400, a non-alcoholic drink in the lobby $10 ($2 in a supermarket). The underwhelming hotel buffet will set you back $75 and a pizza on a street corner $25. A regular taxi ride easily adds up to $50, especially since the taxi company (the only one in town) starts the meter as soon as the car leaves the depot. There are no cruising cabs. For a driver with a decent car I paid $350 per day (for two days only, then I walked everywhere in 35°C heat and 100% humidity). An apartment costs $10,000-$15,000 to rent per month or at least a million dollars to buy. Labourers get paid $50 per month. That tells you a lot about the gap between rich and poor. Angola has one of the worst Gini coefficients in the world. 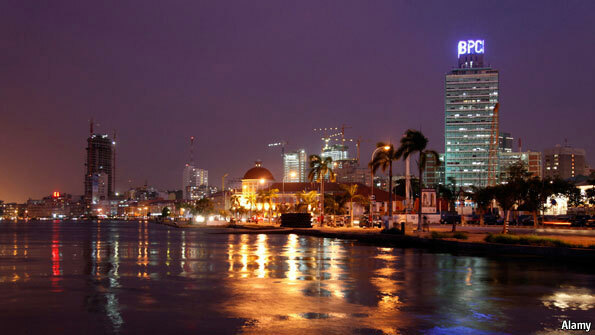 For several years Luanda has been the most expensive city in the world. That is not primarily a consequence of the influx of oil money, although there is a lot of it about since Angola is sub-Saharan Africa’s second biggest producer. The crazy prices were initially the result of limited supply during and shortly after the civil war that ended in 2002. When peace became permanent, trade routes opened up again and new companies tried to enter the market. But insiders had come to like the wildly above-average profits they were making and so made sure the trade barriers stayed in place. In Luanda an avocado can cost $5, while in the countryside you get a hundred avocados for $10. To get fruit to town, lorry drivers and merchants have to negotiate a mesmerising obstacle course of bribe-seeking officials, guards, thugs, policemen and soldiers. The supermarket Casa Dos Frescos sold a melon for $100 shortly before Christmas to an irate Frenchman. He tried to sue the retailer for profiteering in a local court last month and presented a picture of the rather ordinary melon plus the receipt. The judge threw out the case for lack of evidence—the original melon. The Frenchman had eaten it. Adcock Ingram planned to expand into west Africa this year, a move analysts said could be very lucrative because of the region’s population and growing economy. South Africa’s second-largest drug firm already has a presence in Ghana through its 66.2 percent acquisition of Ayrton Drug Manufacturing, which was concluded last year. Chief executive Jonathan Louw said the group had already transferred a local employee to join the management team led by Ayrton managing director Samuel Adjepong. “He has been of great (help) in the successful conclusion of the acquisition and subsequent integration of the business with Adcock,” Louw said in the company’s 2010 annual report. Adcock currently has 183 product registrations in the rest of Africa. This year the group anticipates registering 59 products and this is projected to reach 500 by 2015. Ishe Zingoni, an analyst at Frost & Sullivan, said west Africa had the largest regional population in Africa and was the key contributor to much of the continent’s enviable economic prospects. “Ghana, precisely where Adcock is regionally based, is poised to become the fastest-growing economy in Africa this year. Growth in incomes, an expanding middle class and changing demographics are all resulting in the rapid development of pharmaceutical markets in west Africa,” Zingoni said. Nazeem Hendricks, a portfolio manager at Argon Asset Management, said it was key for the company to find new markets because the local one was mature. “Having said that, companies with a lot of cash like Adcock must make acquisitions that are well considered. Despite all the positives, Africa has always been a risky proposition but potentially, it could be very lucrative,” he said. As of September 2010, cash on hand was R1.4 billion. The company will also spread its footprint over the continent through marketing and distribution deals signed with MSD, Lilly, Novartis and Roche. The five-year strategic collaboration with MSD South Africa, a local subsidiary of US-based Merck has been extended to sub-Saharan Africa. Two years ago, it set up Adcock East Africa through a sales office in Kenya. Adcock said that growth in pharmaceuticals, its largest unit, was driven by double-digit volume growth in government tenders, antiretrovirals and the rest of Africa while over-the-counter (OTC) drugs experienced a decline in volume. Mark Ansley, a portfolio manager at Cadiz Asset Management said OTC was more competitive now with a lot of players, including Tiger Brands, which previously did not compete with Adcock as it was its parent company before the unbundling. “Private labels such as Dis-Chem and Clicks are growing to the detriment of traditional players. There is also competition from Pick n Pay, Shoprite and Spar,” said Ansley. Hendricks attributed the slump to struggling consumers. Adcock is planning to obtain international accreditation for its facilities. A week after Virgin Group founder Richard Branson gave South Africa the thumbs up as an investment destination, Virgin Group chief executive Stephen Murphy has said the group has major plans for the country. "We see South Africa as a key territory for the group," said Murphy in an interview with Fin24 on Monday. Murphy has been the head of Virgin since 2005 and was responsible for navigating the group through the financial and economic crisis, part of which included identifying key markets. One such market is South Africa, where Virgin now has six operating businesses which employ more than 5 600 people. Murphy said South Africa has made "terrific progress" and has evolved into a stable economy. He said that this was not always reflected in the global capital markets, which continue to apply an "unrealistic discount" to South Africa. He also praised the local banking system as "first world". Murphy said that the Virgin businesses in South Africa were creating intellectual property which was exported to the rest of the world. These included the Branson Centre of Entrepreneurship and the health and wellness businesses which export intellectual property into the US market. The concept of the Branson Centre of Entrepreneurship was first tested in South Africa and is now being replicated in the Caribbean. When asked about onerous regulatory issues such as labour markets and limited competition in telecoms and financial services, Murphy said South Africa was not the hardest place for an outsider to do business in. He said that with the financial crisis still fresh in people's minds, regulation in the US and UK - particularly around banks and financial services - was extremely challenging . "People should reappraise their views of regulation - prudent regulation is essential," said Murphy. In five years' time Murphy said he would like to see the South African businesses continue to be disruptive in the markets they play in, and to focus strongly on championing consumers. The Financial Times ranking of Business Schools around the world was published yesterday. The top schools as estimated by the schools themselves and by the opinions of their alumni were jointly the London Business School and the Wharton School at the University of Pennsylvania. Third was Harvard and joint fourth, Insead and Stanford Business School. In 60th place (up from 89) in 2010 was the Graduate School of Business (GSB) at the University of Cape Town. It is the only business school in Africa that is ranked in the FT Top 100. Most interestingly the GSB ranked first in the value for money category. This has a low 3% weight in the overall score and so could not have made a great difference to the ranking order. Much more important for the ranking measure are the categories weighted salary with a 20% weight (the average alumnus salary today with adjustment for salary variations between industry sectors. Includes data for the current year and the one or two preceding years where available) and the salary percentage Increase with another 20% weight (The percentage increase in average alumnus salary from before the MBA to today as a percentage of the pre-MBA salary). The weighted average salary of UCT alumni in 2011 was estimated as US$140 896 and the average increase as 76%. By comparison the weighted salary for the top school London was little more at US$145 776 and US$171 551 for the average Wharton graduate. The Harvard average was US$170 238 and that of Insead US$147 883. The Cape Town graduate salary after graduation thus compares very well with those of the best schools. The Chicago (ranked 12) graduate earns an average US$151 173 after graduation, the average Yale (ranked 15) MBA earns US$146 999 while graduates from the Stern School in New York (ranked joint 15th) earns US$138 865. The salaries earned by graduates of the high ranking European and Asian schools typically earn less than their American and Cape Town contemporaries. The graduates of the top schools typically enjoyed more rapid increases than the average Cape Town which suggests the quality of the Cape Town student. But on the value for money axis, the top schools ranked very poorly. London ranked 57 on value for money, Wharton 89 and Harvard 87. New York was ranked 91 for value for money and Yale 79. On the value for money scale the European schools were more competitive. The mixture of great value for money combined with highly competitive after graduation salaries and a highly acceptable increase in salaries surely makes a Cape Town MBA a highly desirable objective (adjusted for purchasing power parity and very good access to beaches and mountains, not to mention good wine and restaurants at reasonable prices, adds to the relative value). According to the FT there would have been another good reason to go to or have gone to the GSB. The GSB judged by its alumni ranked as high as sixth in Economics behind Chicago, MIT, Cranfield, Imperial College London and the University of Rochester, and ahead of Yale and Wharton. As far as I know the Economics curriculum at UCT has been designed and taught by a mere two lecturers in recent years. Take a big bow Barry Standish; your students clearly appreciate your efforts. (Modesty prevents me from naming the other major contributor to economics at the UCT GSB). JOHANNESBURG (Reuters) - Nestle is spending $70 million on expanding its business in South Africa, as the world's biggest food group sharpens its focus on emerging markets. Nestle said in a statement on Wednesday it will spend around 500 million rand on a new cereal factory and expanding its noodle business in Africa's largest economy. The maker of KitKat chocolate bars has said it wants at least 40 percent of its business to come from fast-growing markets such as Brazil, China, Ghana and Vietnam within ten years, up from about 30 percent now. Home to about 1 billion people, Africa is expected to see its population double by 2050. The explosive population growth, together with rising personal incomes, makes the continent an increasingly attractive target for Western corporations.